Mark Taylor has been actively involved in the tennis community from a young age, beginning with his competitive career which grew into coaching. As a player, Mark participated in many tournaments at the local NCTA level in Ottawa as well as in provincial OTA and FTQ tournaments at the junior and open levels. In addition, he played in Circuit Canada Series and ITF Futures tournaments. He also played in many pro-am charity tournaments in the Toronto area, as well as, in an exhibition match with Denis Shapovalov in 2017. Mark is a member of the Tennis Professionals Association and a certified Tennis Coach through Tennis Canada. His love of the game drives him to obtain higher coaching certifications and to learn new skills and techniques which he can apply to his coaching. Through Tennis Canada, Mark earned his: Tennis Instructors ‘Certification in 2007, Club Professional 1 in 2007 and his Coach 2 Certification in 2011. In order to advance his coaching skills Mark has traveled to work courtside with highly advanced Tennis Coaches, including Bob Brett, coach to grand slam champions such as; Boris Becker, Goran Ivanišević, and Marin Čilić at the Bob Brett Tennis Academy in San Remo, Italy. Mark has built a career coaching juniors’ through adults from beginner to elite levels. He is experienced with running successful tennis programs and has coached junior players in the National Tour Program. 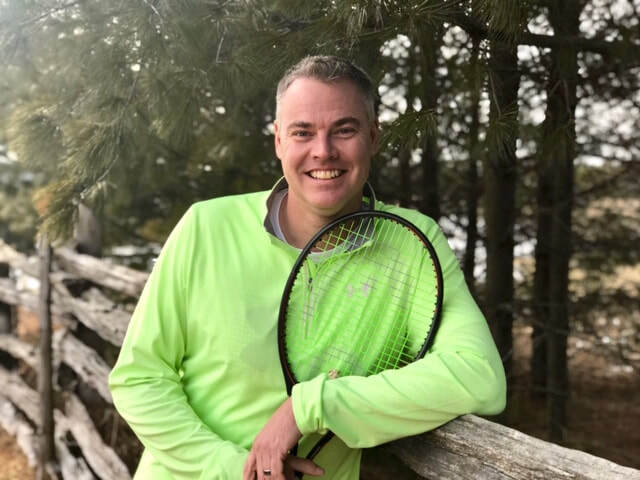 Mark is our Head Tennis Professional and will be running our junior and adult programs, he will also be taking private lessons! Mark lives locally with his wife Suzanne, his two-year-old son Noah and is expecting his second child this summer.